This Kids Darth Vader Costume is a deluxe outfit which includes everything your little one needs to transform into the Dark Lord himself. This Kids Darth Vader Costume comes with Mask, Cape, Belt and Jumpsuit and is part of the official Star Wars fancy dress collection. This deluxe version is packed with detailing, including a detailed jumpsuit which has a moulded design, to create a really quality look. The moulded belt coordinates perfectly with the jumpsuit and simply ties to fasten. The black cape then perfectly completes the outfit. 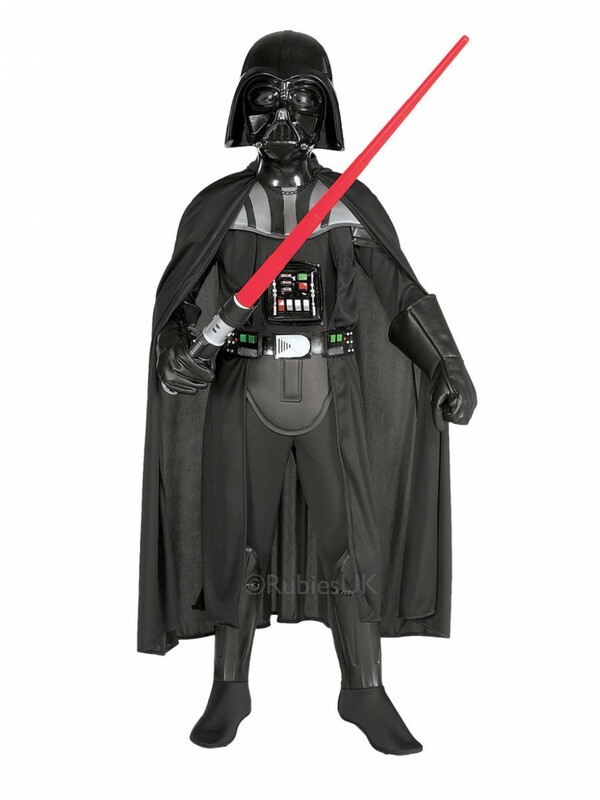 Last but not least, a black plastic mask is also included, completing this deluxe Kids Darth Vader Costume. Available in 3-4 Years, 5-7 Years, 8-10 Years, 9-10 Years, 11-12 Years and 13-14 Years.